MD (Transfusion Medicine / Pathology/ Microbiology) or PhD (Biological sciences) with 10 years experience in Blood bank and other blood transfusion services. Essential Qualification/ Experience: MBBS Doctors preferably with Degree or Diploma in public Health, Skin & VD. Gyne and Obs or other medical domains, along with relevant experience. Essential Qualification/Experience: MBBS Doctors preferably with (Degree or Diploma in Public Health, Skin & VD, Gyne and Obs or other medical domains, along with relevant experience. Deputation posts will be filled from the regular officers/officials of Delhi Govt., Central Govt./ Local Bodies and Autonomous Bodies. Application must be accompanied with certificate from the present head of the office that no vigilance case is pending/ contemplated against the applicant. 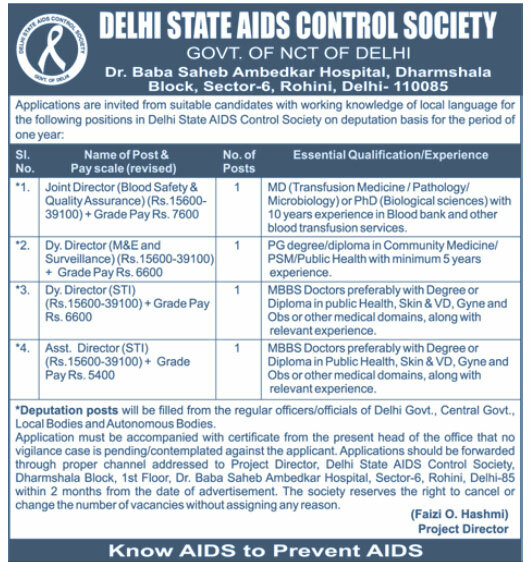 Applications should be forwarded through proper channel addressed to Project Director, Delhi State AIDS Control Society, Dharmshala Block, 1st Floor. Dr. Baba Saheb Ambedkar Hospital. Sector-6, Rohini. Delhi-65 within 2 months from the date of advertisement(07.11.2010). The society reserves the right to cancel or change the number of vacancies without assigning any reason.